One of our most spectacular and magnificent visitors. Osprey can now be seen again at various sites in the UK after returning from their winter homes. Having spent a full season helping out at volunteers at one the visitor centres in the Scottish Borders, this is a subject that we know quite a lot about and have had the privilege or watching a couple of pairs throughout their breeding season; from choosing nests, sitting on eggs through to hatching and rearing their young before finally fledging. Incidentally we believe that we may be part of a small record between ourselves and The Tweed Valley Osprey Project – Jack was about 10 days old on our first ‘shift’ manning a centre after he was born! Surely one of the youngest ever volunteers! Having spent the winter in the warmer climes of West Africa, ospreys have now made (or are at least in the final stages of) the 5000 mile journey back to our shores, arriving from mid March through to the middle of April. 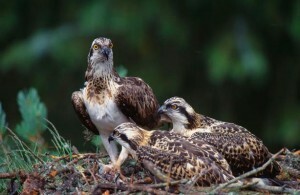 From our experience during this season, and the training that we received the information below will be a brief introduction to Ospreys and also list a few of the sites where you will be able to see them, either on CCTV or where you may be lucky enough to see them out fishing on open water. Ospreys in the UK have had a troubled and turbulent past, becoming extinct as a breeding bird in 1840 in England and 1916 in Scotland. Thankfully natural re-colonisation began to occur in 1954, and after a very slow start the number of breeding pairs rose to around 160 in 2001, the vast majority being in Scotland. In the same year though, England enjoyed its first breeding pairs for almost 160 years, with a natural pair in the Lake District and a reintroduced pair at Rutland water. An osprey is a fairly large bird of prey with a wingspan of around 5 feet. Their appearance can be seen in the photo below. What makes them remarkable is the fact that their diet consists mainly of fish. Their fishing technique is to glide over the surface of the water at around 70m, when they spot their prey they plunge into a near vertical dive and can reach speeds of around 80mph before hitting the water. Upon hitting the water they may completely submerge by up to 1m before using their powerful and specialised wings to pull themselves up and out of the water, hopefully with fish in toe (or should that be talon…). 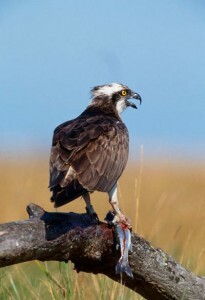 Interestingly, ospreys then manoeuvre the fish so that its head is pointing in the direction of travel to reduce drag. This fishing method is not without flaw, and even an experienced adult is only expected to be successful in 1 in 4 attempts. Perhaps surprisingly, given the distances covered, ospreys generally mate for life. The more experienced pairs are also usually the first back and more often than not return to their previous nest sites. Having arrived they quickly set about tidying up the nest in preparation for their eggs. Eggs are laid in the second half of April and are incubated for 5 to 6 weeks. In the early stages the female tends to stay with or very close to the chicks, with the male being responsible for providing food. An osprey chick’s childhood is remarkably short and the amount of food provided for them is reduced until they are forced to leave the nest to find their own food at around 6-8 weeks. Their rapid development does not stop here and they are only allowed around a further 6 weeks to not only master the art of fishing, but also to strengthen their flight to allow them to attempt their first migration. All in all this is only 13-14 weeks from hatching through to beginning their first migration of 5000 miles – a real baptism of fire! To make things tougher still, the adults leave before the young who are expected to find their own way to their wintering grounds – nobody yet knows for sure how this is achieved. As can be expected by this survival of the fittest, mortality rates amongst young osprey are very high, with 40-60% of the young birds not surviving their first year. For the lucky ones who do make it, they are allowed what is perhaps their first reprieve and do not generally return to breed to 3 years.